Working out is great to be doing and it’s always recommended in everyday life. However there comes a time when you’re unable to know which workout to do or how many workouts you’ve done. Reason being is because you didn’t track your workouts every single day. But and easy way to fix this would of course be to have a journal or workout log to keep you accountable. What if there was a way that you could have an online super gym to log your exercises and connect with thousands of other fitness enthusiasts? Well….welcome to wowy, your online super gym. Wowy stands for Work Out With You. Wowy gives you the ability to track your workouts every day. You can also schedule your workouts months in advance if you choose so. It frees you up of having to worry about which workout to do each day. It also gives you a little bit of incentive to do your workouts as you’ll be able to show the whole world which workouts you’ve done over the past month. Not only that but you’ll connect with thousands of other individuals that love fitness. Oh I forgot to tell you that wowy was created by Beachbody which is the makers of P90X, Insanity and the Healthiest Meal of the Day(Shakeology). So you’ve got award-winning programs behind you and at your fingertips if you’re interested in trying out those. After you finish your workout you’ll be able to jump into the cooldown chat which has lots of people instantly all chatting about how their workouts went or sharing health information. If you have problems or need question you can post on the Beachbody forums as well. Wowy offers a huge social environment for you to enjoy. I use it everyday to check my workouts and keep myself accountable. Being able to post when I’m starting my workout and inviting others to join on my Facebook and twitter is also a plus. 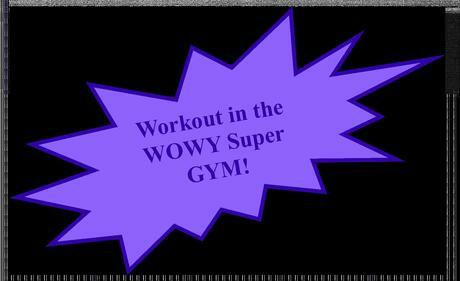 If your interested in joining wow super gym then please sign up for free here. I hope to see you guys in the other side!